Home » QUILTsocial eMagazine » FREE! 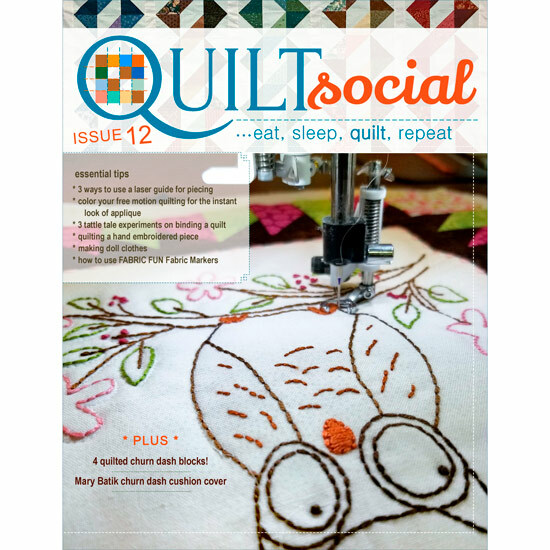 QUILTsocial Magazine Issue 12 Now Available! Don’t miss the 11 essential tips for quilting on a domestic machine. See which machine features help you to accomplish beautiful quilting results. We also look at how we can get even more creative, if that’s possible, by using FABRIC FUN Fabric Markers to enhance your quilting, make it look like it were applique, make your own ‘printed’ fabric and add dimension, all using these fabric markers! We’re taking a close look at the features of the Husqvarna Viking Designer Ruby deLuxe and Brother Dreamweaver XE, which you don’t want to miss. In exploring the features, we also explore what’s important to know when quilting a machine embroidered piece and a hand embroidered piece – what’s the difference? Find out in this issue! Included are several quilting projects using Northcott fabrics, including one of Banyan Batiks latest, Mary Batik. Make sure you scroll to the very end there’s a drop dead gorgeous quilt called Birds of Paradise by none other than Elaine Theriault. The pattern is reminiscent of the exotic birds. Download your own PDF copy to your device, FREE FOR A LIMITED TIME! Only until November 30th, 2018. Or…download the FREE QUILTsocial App and get your FREE issues of QUILTsocial Magazine on your tablet or smartphone! Download NOW to get your FREE copy of Issue 12 for a limited time until November 30th, 2018. Click on the banner below to go to the download page. A printed version of QUILTsocial Issue 12 is available HERE. Thanks for sharing the magazine! It’s jam packed with great ideas and projects! I just love the colours in the new fabric giveaway. I am so excited to be part of the free mag. in my email. I am new to quilting and am ADDICTED. 🙂 just sayin my first quilt was a queen sized bedspread. Yeah, go big or go home. I hope we have lots of fun together. Welcome Yvonne! Let the fun begin! Thank you for following QUILTsocial! Thank you so much for sharing your magazine. It is nice to browse through the pages and make a thing or two. Thank you for the Quilt Social magazine. I appreciate the effort that goes into free products. Each page is jam packed with lots of neat projects and information. Thanks! From a domestic machine quilter.